Oh boy! At least he wasn’t under it. When I was 2, I tried climbing my dresser and it tipped over on to me. Couple stitches in my head, otherwise, I was okay. My mom, on the other hand…. well, I suppose you can imagine. So true! I’ve heard stories like yours and they terrify me! I bet your mom still isn’t over it. Is that your nightstand?! Oh boy. Look at his guilty little face, lol. Yes, it is! And it is full – so has some weight to it. Holy smokes! Yesterday morning while I was brushing my teeth, I heard a huge thump. I ran into my bedroom (literally 3 steps away) and saw Raegan on top of my night stand. She had cleared the top of it and was sitting happily on top. I nearly had a heart attack. I’m terrified she’s going to do something like this…. His guilty face is awfully cute tho….. I swear, by the time I wake up tomorrow, every piece of “small” furniture will be in our basement in storage. B is going to freak out over this – and I can’t even say I’ll blame him! This freaked me out beyond belief! I think I may start calling him that! He makes the cutest little face (and sound) when he flexes his muscles. He didn’t do that this time though (which is our warning that he’s about to try something crazy) – he just toppled it over. Unreal. Damn little dude! Trying to make a point?? You just get ready! Your strong boy is coming!!!! Ahhh what a strong little guy!! We are bracing a bunch of furniture to walls this weekend before Alidia starts doing the same. Although I didn’t even think of little furniture like this but I bet that’s the stuff she’ll go for once strong enough! Eeek. The face says a really sincere oops?!? 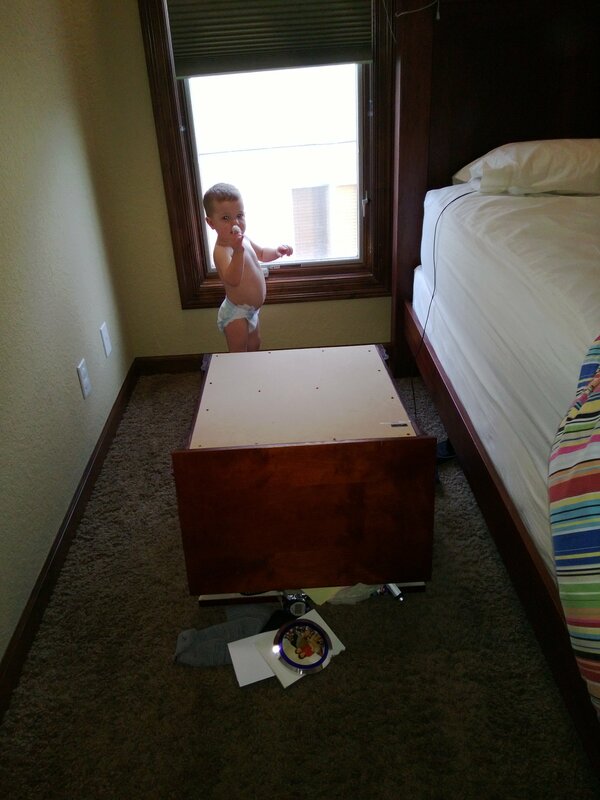 Another reminder of more baby-toddler proofing we have got to do here…I am not sure boys ever outgrow the destruction phase! Uh oh! So glad his toes or fingers didn’t get caught underneath!